Do you wish to revive the good look of your windows rapidly and efficiently?Are you searching for methods of efficient window cleaning? If yes, you have come to the right place! With the specialists of window cleaning in Cheapside, you will certainly bring back the sun rays into your house. You will enjoy spotless glass surfaces as well as completely clean framework and ledges. You will be able to use your recently-acquired spare time as you wish while we polish the glass surfaces of your home. You will not only avoid this time-consuming and burdensome work – our services will also present you some attractive benefits. We also provide our professional services in nearby areas: Broad Street, Bishopsgate, London Wall, Moorgate, Broadgate. You can rely on the team - they are the true experts of window cleaning. They all have passed through complex training sessions, so you can receive efficient help for all glass surfaces kinds. What we can wash includes: small, double, sash or bay windows, garden windows, patio doors, French doors, conservatories and skylights. Your house can freshened instantly with our assistance. Call us every time you need great window cleaning for your home or business. We are happy to use the best methods to make sure that you have the best window cleaning. The glass surfaces of your building will look spotless after we use water-fed extension pole cleaning system and high pressure cleaning on them. We use our vans to supply the poles with water and we can reach up to the fourth floor. In case you request polishing of highly-placed windows, we have rope access cleaners available. Call us on 020 3746 3113 and get in touch with us – these effective techniques will bring you results right away. You will appreciate the perfectly looking office with the help of the adepts of commercial window cleaning. You can rely on our first-rate services for all kinds of business premises. For example, if you have a small shop, we can completely wash its windows by using water fed extension pole system – it gives us the chance to as high as the fourth floor. If you seek spotless look for the glass panes of a tall business property in London and the neighbouring areas, we will put in use our rope access tools. In any case, you will appreciate superb results in no time. 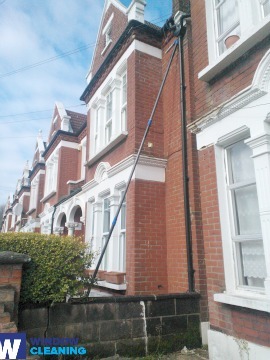 The experts of window cleaning in Cheapside will revive your dwelling. We provide the finest window cleaning services in Cheapside. Our procedure includes water fed extension pole system and also high-pressure cleaning. We keep your health and safety with non-toxic solvents and purified water. Become part of our satisfied customers – dial 020 3746 3113 and speak with our customer service staff. You can also book our services on-site – just fill in our booking form or use our chat facility.